Welcome to "The Equine Therapist" We specialise in manipulation and massage for horses to reduce pain and increase mobility and movement. Our range of treatments are non invasive and drug free and are designed to work naturally with the horse's own body to encourage healing and reduce pain and discomfort. The therapies that we offer are suitable for horses of any age or ability, from top level competition animals to much loved family pets and our objective is to provide a safe, natural and relaxed method to treat skeletal and muscular problems. 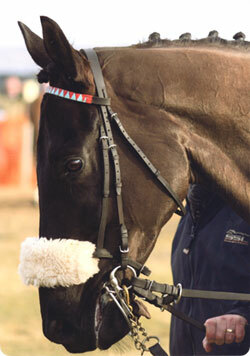 Based in the Staffordshire and West Midlands area, we will travel to you to treat your horse in it's home environment. Clare, our qualified therapist, Dip. MCAM (OCEPT), and Equine Touch has worked with horses for many years and provides a relaxed, friendly but professional service at a competitive price. We are very happy to work with you, your vet, farrier, saddler or equine dentist to help treat your horse and keep it in prime condition, not just for competing but also to ensure that it is pain free and enjoys natural and free movement.